Inductive sensors are used in applications where only metal parts have to be detected. This has the advantage that pollution has no influence on the functioning of the sensors. An inductive sensor has a wear-free function due to the non-contact principle. Read more about inductive sensors. 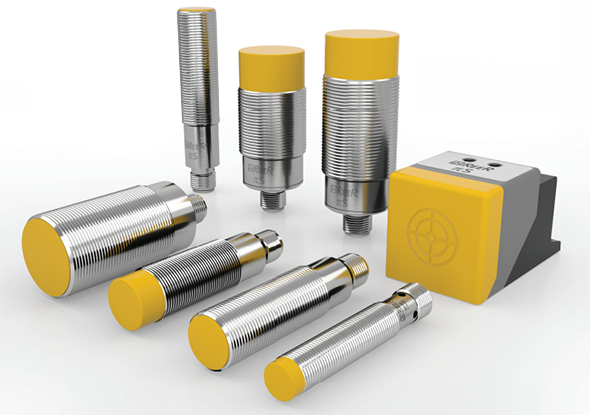 New to the ReeR Safety range are the inductive sensors for safe applications. Machines and robots can be secured to a safety class of PLd or SIL2 with the use of these sensors. Safe inductive sensors can be used for door detection, toothwheel detection for speed monitoring, shaft position detection, end stop robot cells and positioning machines. The two safe OSSD outputs can be connected directly to the safety relay, the "AD SR1" or to the programmable safety PLC "M1 Mosaïc". The inductive fail safe sensors all have a degree of protection of IP65 and IP67. There is one version with a protection rating of IP69K that is suitable for use in the pharmaceutical and food industry. The inductive sensors are available in M12, M18, M30 or a block form 40 x 40 mm.